Mr. Railton has a singular and honourable record in the Driffield Circuit. For forty-two years he has held the office of Circuit Steward. Successive ministers have by letter testified to his efficiency and kindness. He has been superintendent of the Sunday School fifty-one years, class leader forty-eight, secretary of Trust Estate forty-one, and seat-letter forty-three years. For twenty-one years he has been the Hull District Orphanage treasurer. Outside our own Church he has held various important positions for a number of years. He is scarcely ever absent from a meeting of any kind at George Street Church or School. He takes a deep interest in everything that makes for the spiritual well-being and prosperity of the Circuit, and has been a generous contributor to the funds. He is a believer in systematic and proportionate giving. He is a good man and widely respected in town and Circuit. 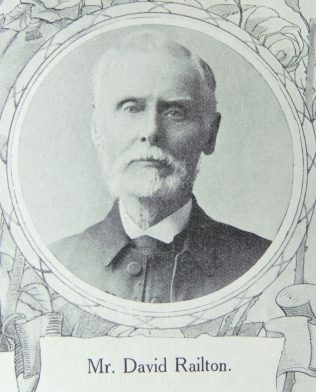 David was born in 1840 at Hutton Cranswick, Yorkshire to parents John and Mary. John worked the land. David was baptised on 25 July 1840 at Hutton Cranswick. Census returns identify the following occupations for David. David married Ann Obee (1841-1878) in early 1864 at Driffield, Yorkshire. Census returns identify five children. David married Elizabeth Parkinson (1839-1890) in late 1879 at Driffield, Yorkshire. David married Mary Knaggs, nee Rudd, nee Blythe (1829-1920) in the spring of 1894 at Driffield, Yorkshire. David died on30 December 1919 at Great Driffield, Yorkshire.